ALMA is a computational model for the real-time simulation of three basic affect types that human beings can experience. ALMA supports several methods to generate affect and it realizes the interference of different affect types. Based on a kind of cognitive appraisal different affect types are simulated in a hierarchical generation process. Hence, the name ALMA, which stands for A Layered Model of Affect. Behavior from human beings, especially interpersonal communication behavior, is essentially influenced by affect. 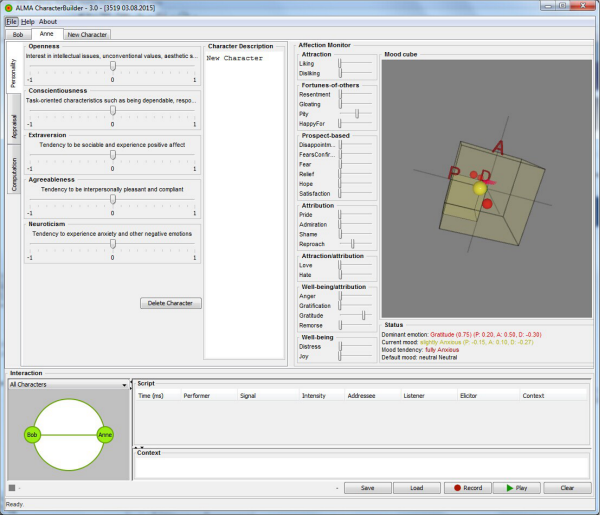 Simulated affect can be exploited for virtual characters used in human computer interfaces in order to make them more believable. A simulation of affect that considers more aspects of human affect is the key for the modeling of a more natural behavior of virtual characters. The aim is the design and realization of a computational model of affect that allows the simulation of plausible affect in real-time. The focus thereby is the simulation of mood and its interaction with other affect types. After an analysis of existing computational models of affect, actual psychological theories about affect are investigated for an employment in a computational model. As a result a model has been created that represents emotions, moods, and personality and their particular relations. Furthermore new input structures for the computation of emotions are developed. Both enable, for the first time, a continuous simulation of mood changes in eight mood classes that is based on an extended emotion computation with different intensity decay functions [Gebhard 05]. Finally, simulated emotions and moods have been evaluated by a study [Gebhard, Kipp 06]. The results show that affect is rated plausible. In the preparation phase appraisal rules and personality profiles for characters must be specified in AffectML format - a XML based affect modeling language. 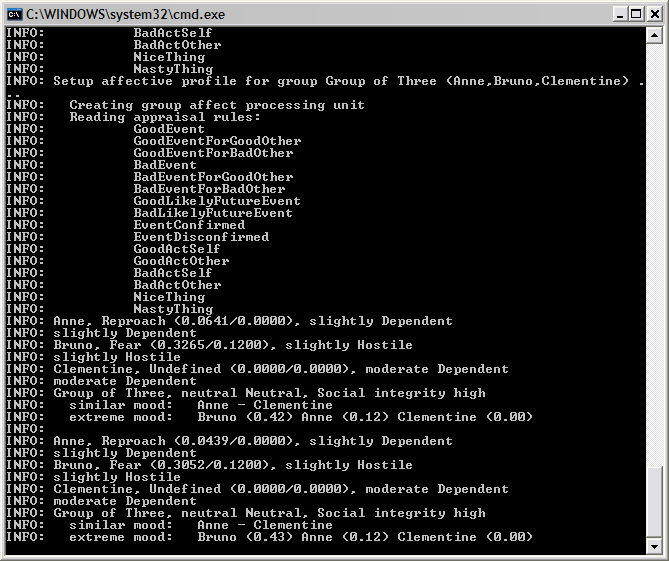 This can be done with the help of the CharacterBuilder tool that comes with the ALMA software package. In the runtime phase, the specified appraisal rules are used to compute real-time emotions and moods as results of a subjective appraisal of relevant input. The computed affective characteristics are represented in AffectML and can be processed by sub-sequent modules that control cognitive processes and physical behavior of embodied conversational characters. ALMA is implemented in JAVA (Version 1.7 or greater). It has been tested on several os platforms: Windows XP, Mac OS X 10.(4,5). It should run at any os platform that fully supports JAVA 1.7 and above. Designing Emotions - An Empirical Approach to Realistic Affect Simulation. In: KI Journal, Special Issue on Emotions & Computing, Springer, 2011. In: Key social, psychological, ethical and design issues, chapter The use of affective and attentive cues in an empathic computer-based companion, pages 131-142. John Benjamins, 2010. First ideas on the use of affective cues in an empathic computer-based companion. In: Proceedings of the 6th International Conference on Intelligent Virtual Agents (IVA'06), 343-356, Marina Del Rey, USA, 2006. In: Proceedings of the Fourth International Joint Conference on Autonomous Agents and Multiagent Systems (AAMAS'05), 29-36, Utrecht, 2005. In: Proceedings of the Tutorial and Research Workshop on Affective Dialogue Systems (ADS'04), 128-141, Kloster Irsee, June 14-16, 2004. In: Proceedings of the 4th International Working Conference on Intelligent Virtual Agents (IVA'03), 48-56, Kloster Irsee, 2003. To appear in: Proceedings of the 8th International Conference on Intelligent Virtual Agents (IVA'08), Tokyo, Japan, 2008. In: Proceedings of the 8th International Conference on Multimodal Interfaces (ICMI'06), Banff, Canada, 2006.